My regular clients know I love talking about food and diets during the spa treatments. For the past couple of months, I have been more involved in raw food diet and juicing than ever before and I like to share it with you. I don’t believe in any extremes as far as diets go, but this one – I promise –it is worth your while. Most of you know, I lost my mom to cancer five years ago and it completely changed my perspective on everything in life including; relationships, possessions, lifestyle, respect to own life, and of course – diet. I’ve been juicing on and off science I was a teenager, but it became my obsession when one of my clients confirmed my belief in its power, by telling me a story of her ill husband who after many conventional treatments was loosing a battle with a very aggressive cancer and was given just a few months to live. Thankfully he is still alive and better than ever, and his doctors have no explanation for this amazing recovery. He wakes up every morning and juices – no exceptions, and juicing was his miracle. There are facts about juicing that are commonly known such as vegetable juice is healthier as opposed to fruit juice (less sugar), it is better to bland then juice so that you get the fiber from the veggies. I personally juice my veggies and bland my fruits. WHY GREEN? Green juices are much more beneficial as opposed to just any vegetable juice. They are power-packed with nutrition. The greens produce chlorophyll, which enable our cells to release stored toxins. A green juice will cleanse your digestive system, lungs, liver, and provide you with a boost of energy. All green plants are also rich in many Vitamins including A and C, which are important co-factors for calcium absorption. Chlorophyll foods (greens) also act as a form of ‘stored sunshine’, to regulate calcium and Vitamin D deficiency. So if you get no sunshine, then increase the greens in your diet. 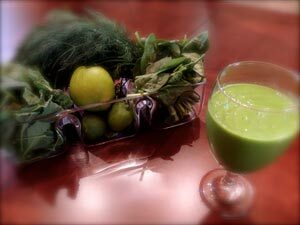 Green juices should be ingested on an empty stomach (first thing in the morning or in-between meals). It is healthier if your juice is green, but any raw juices deliver a powerful amount of vitamins, minerals and enzymes that are absorbed immediately into the blood stream, so any juice will do. It is important, however to avoid combining vegetables with fruits, as they require different enzymes for digestion. The only exception is an apple, which has a more neutral effect. Pinch of fresh ginger, ENYOY!! !